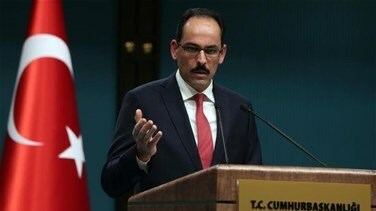 Turkey expects President Donald Trump to use a waiver to protect it if the U.S. Congress decides to sanction Ankara over a planned purchase of a Russian missile defense system, a Turkish presidential spokesman said on Tuesday. Turkey has not backed down from its purchase and said it should not trigger sanctions as Ankara is not an adversary of Washington and remains committed to the NATO alliance. Speaking to reporters during a trip to Washington, Ibrahim Kalin, spokesman to Turkey's President Tayyip Erdogan, said Ankara hoped a solution would be found to avoid sanctions. "If it comes to that, that is the sanctions proposed to be implemented by the Congress, of course we will expect President Trump to use his power for a waiver on that issue," Kalin said. "He may have a good case to make to the Congress," he said. U.S. officials have called Turkey's planned purchase of Russian-made S-400 missile defense systems "deeply problematic," saying it would risk Ankara's partnership in the joint strike fighter F-35 program because it would compromise the jets, made by Lockheed Martin Corp. Turkey has refused to back down and said it will take delivery of the S-400s in July. Kalin said Ankara has proposed to Washington that the two countries establish a technical committee under the umbrella of NATO to determine whether S-400 system endanger the F-35 jet as U.S. argues and that it was waiting to hear back from the United States and NATO. "Because it really comes down to this technical issue. The main argument that we are presented with is that it will jeopardize the F-35s. Let's find out if that's really the case," Kalin said.